When I was cleaning out my DVR today, I came across a program I had forgotten about that was taped a month ago. It was an hour of TV I didn’t know if I could watch . . . yet at the same time, it was something like a train wreck I just couldn’t turn away from. As I pressed play, 1998 came rushing back to my mind almost immediately. Some of the most vivid sports memories of my life. It was the documentary of the Minnesota Vikings’ storied year, a chronicle of the best and worst football season I’ve experienced. Cris Carter, John Randle and Dennis Green narrated the show, and through their recollections, I felt like I was back in my seat in the Metrodome for all eight home games. Now that its ten years and one amazing How I Met Your Mother episode later, you would expect that the soreness of the subject had worn off. It hadn’t, by God, it definitely hadn’t. Even though I was a teenager who had experienced Game 6 of the 1991 World Series in person, being there for the entire Vikings 15-1 crusade was the craziest sports ride that I can ever remember. Going to each game, you knew it was going to be another Vikings win, Randy Moss was going to catch two touchdowns, and John Randle would bust a boatload of skulls. It was a given, not even a doubt in my mind. Just like clockwork, it happened week after week, for each of the first eight games I went to. The dome had never been louder, packed end to end with a sea of purple, making your ears hurt every time you walked into the stadium. 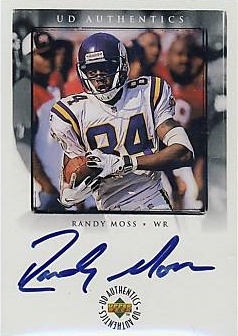 I also remember my collection of football cards that year growing exponentially, filled to the top of my shoebox with Randy Moss rookie cards and all the Vikings I loved with a passion. I had to get every card there was; on my teenage Dairy Queen wages, it got especially tough as the year went on, and the Vikings got hotter and hotter. Funny enough, many of those cards are still in my collection today. Then came the playoffs, and it seemed like every domino was falling just like it had all season. The Cardinals were up first on the chopping block, an appetizer for the new Purple People Eaters. My journey to the game was an eye popping rouser of how far the Vikings had come, brimming with the impending excitement of the postseason. We drove down the 394 freeway towards downtown, flags waving from the windows of our car, feeling like this was finally going to be the year that the choking would stop. Seemingly each car we passed had the same flags, stuffed with people in purple facepaint. When we got to my dad’s office building and parked, we saw the extent of how much this team had affected the whole city. People were packing into the elevator, huge smiles on their faces, Vikings sweatshirts on their backs. As the game started, it was easy to see that the Cardinals were overmatched. Cunningham was completing passes as if there wasn’t a defense, and the Vikings defense made Jake Plummer into their personal Rock ‘Em Sock ‘Em Robot. The crowd was so loud that I couldn’t even hear myself yelling at the top of my lungs. Then, without warning, the house of cards started to come down, spade by spade as John Randle was injured on one of the last plays of the game. I didn’t know it at the time, but things were about to go from unbelievably awesome to the ridiculously bad. The Vikings may have come out of the week with a convincing win, but something wasn’t right. I felt it running down my spine like a cold shiver. I went home and turned on ESPN to see who our opponent would be, and wasn’t surprised to see that the Falcons had a ticket to Minnesota for one of the biggest games in Vikings history. The rest of the week, I think I may have worn my Robert Smith and Cris Carter jerseys every day to school. Unfortunately, I couldn’t help the anxious sentiment and feeling of impending doom, much like I had felt prior to my first time at a World Series game. As a true Minnesota sports fan, you become accustomed to your teams not living up to their potential. It’s a part of our culture, and practically comes with the deed to your house. My dad had unfortunately experienced it five times in his life, once with each time the Vikings went to the Super Bowl, and in the 1965 series against the Dodgers. I knew he was no stranger to living in “Loserville, USA,” and I tried to convince myself that the same label would not be branded onto my sports soul forever. The first half trudged forward, replacing the doubt with jubilation thanks to each Vikings score. Then, as if it were pre-ordained, Dennis Green took our buzz and crushed it with a QB kneel to end the half instead of going for the jugular. It was the beginning of the end, and many of us were starting to wonder if the ghosts of seasons past were coming back to haunt the Purple once again. But the Vikings were still ahead (a feat in itself), and the crowd was stirring with each passing moment and tick of the clock. During halftime I went to get a coke and a dog, only to see a mix of happy faces and general wonderment over the prospects of going to Miami to face destiny for a fifth time. Like any other Minnesota game, a win wasn’t guaranteed until the team was walking off the field, something you could see on the faces of many people I passed in the hallway. Undeterred, I climbed back to my seat and prepared myself for the second half. I don’t think my dad and I exchanged any words that whole game, only screams and boos whenever the game demanded our participation. That all changed when “Mr. Perfect” Gary Anderson, walked onto the field to put the final nail in the Falcons’ purple coffin. “Dad, I don’t know if I can look…” was the only thing I could muster, despite the fact that Anderson hadn’t missed a field goal all season. My fear was warranted as the kick sailed wide of the uprights, cementing that doubt that had transformed from a passing feeling to a full blown animal. Still, the Vikings were still ahead by seven, with less than a minute to go, and all they needed were four stops from a defense that was down five starters. Without hesitation, the Falcons scored and sent the game into overtime, exactly the opposite of what the Vikings had done for fifteen games that season. When the Vikings’ first drive in overtime stalled, I knew it was over. Sure enough Chandler led the Falcons into field goal range without much effort, and Morten Anderson kicked the winner to send 56,000 fans home in disgust. At the time, I felt like someone had come and kicked me in the teeth. It was beyond painful to think that after the best season in Vikings history, they were going home empty handed. You could have heard a pin drop from across the dome as we filed out, while my dad and I didn’t speak a word. That was a long time ago, but the season still hits me like a ton of bricks each time I come across it. The show on the DVR beckoned me to relive my hellbound roller coaster, and I couldn’t resist its seduction. 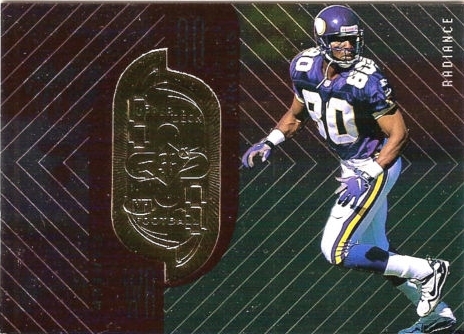 Afterwards, I went straight to my closet to pull out my set of 1998 Vikings cards from Upper Deck, all the while thinking about what 2009 will bring for my beloved team. Although my life has changed, and my card collection has grown exponentially, I still cherish that season as the turning point of my sports life. I follow the Vikings just as intently as ever, and I have Carter, Moss, Randle and Cunningham to thank for it. Who knows, maybe this year will be different. Adam Gellman runs the collecting blog Sports Cards Uncensored, and has been a collector of all things sports for over 15 years. To see more of his work, visit www.sportscardsuncensored.com.